Copyright 2011 Yoursigns Ltd. All Rights Reserved. Brochure Requests - Sorry, we no longer send out brochures - All our House Signs and prices with all options are shown on the DETAILS pages for each house sign range on this website. When you order from us on this website, we only collect the information we need to complete the order and we NEVER sell or pass on customer details - We communicate via email at different order status stages. - We hate SPAM , so once your order is completed we won't send any more emails. The signs in our Flower Motif Range are made to look like traditional cast iron plaques but are actually made from reconstituted slate which is much tougher than real slate. All house signs in this range have a a brightly coloured raised floral motif on a plain black background with contrasting white reflective numbers and text in a choice of different fonts as standard. Based on traditional English cast iron designs, the colourful motifs are hand cast as an integral part of the signs and are raised in relief. The motifs are hand painted in U.V. resistant enamel paints by our sign artists in a choice of several standard colours. Customers can specify their own choice of colour for the flower motif for a small additional fee. An ideal solution if you know the style of sign you wish to give but would like your recipient to choose the options such as the text layout, font , etc. We can send the Certificates to you or your named recipient by email or via Royal Mail Special Delivery - Guaranteed to arrive next working day by 1pm. Click 'View Details' icon for any house sign below to get it's description page showing many more examples of suggested text layouts, colours and font options. You can also order the sign online from that page - The house sign prices featured here are for a basic standard black background with white reflective lettering and numbers. Our elegant ’Windsor’ flower design house plaque has a hand painted floral motif in raised bass relief. Our sign artists use only U.V. 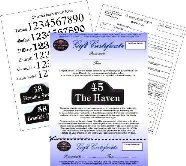 & weather proof enamel paints to give you a quality house number plaque that will last for decades outdoors. The floral motif is offered in a choice of several standard colours shown on the detailed page or you can choose your own colour for a small extra charge. 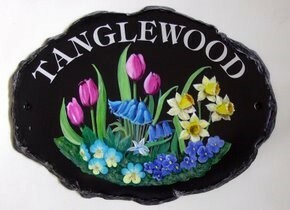 This Mews flower design house plaque has a hand painted floral motif in raised bass relief. Our sign artists use only U.V. & weather proof enamel paints to give you a quality house number plaque that will last for decades outdoors. The floral motif is offered in a choice of several standard colours shown on the detailed page or you can choose your own colour for a small extra charge.